I'll be honest: I haven't been watching the Presidential debates. They're too painful, and I immediately begin to feel physically sick with rage whenever I do catch them (and also I know who I'm voting for, so I don't see it as necessary). I've instead been relying on recaps and Twitter breakdowns, but this video, in which kids react to the second debate, shows all the problems with Trump's arguments on a creepily basic level. Strip away the pundits and the Twitter trolls, and it magnifies it all. It's so easy to see what's going on, a baby could get it. Literally. This particular response video was posted by SheKnows, a pop culture and parenting media hub dedicated to "empower[ing] women to explore and pursue their passions." Hatch, an offshoot of SheKnows, creates and spotlights content created by and for kids, with an emphasis on digital storytelling and media literacy. (These younger generations, man, they're on top of it). So far, the Hatch Kids have covered everything from bullying and "decoding mean" to microagressions to Super Bowl ads. Their eloquent, enlightened views make a huge number of us older folk look... kind of bad, honestly. But that's OK, because this all matters. Keep it up, you tiny digital natives; you are truly fighting the good fight. Which brings us to the debate video. The premise is simple: Show kids the debate; ask them what their impressions are; realize that they 100 percent know what's going on; feel sad for our world; repeat. 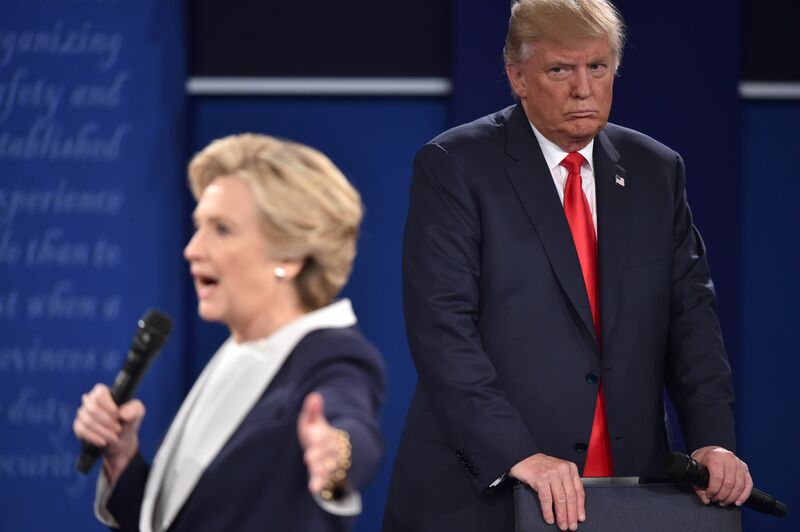 Highlighted by the Hatch Kids, here are all the problems with Donald Trump's debate performance — and his comportment in general. He may say his temperament is his greatest asset, but these kids see what's really going on. "ISIS chopping heads" isn't actually an answer to, "You bragged about sexually assaulting women — thoughts?" And if it offends someone, then they just don't get it, or they heard it wrong, or they're crazy. We've seen this time and time again, most notably in his habit of saying, "I never said that" in response to someone calling him out for something he's said — even when he's literally on record as saying the thing he's now denying he said. That's called "gaslighting." What he says is not what he does. Saying you have respect for women doesn't mean you actually do have respect for women — especially if the way you talk about them is by calling them "pigs" and "grabbing them by the p*ssy" without their consent. That kind of behavior demonstrates nothing but disrespect. Having respect for women means actually treating them with respect.